satisfies the requirement of legionella (退伍軍人症) hygiene control. building while saving energy at the same time. The HWAT single pipe system - ingenius through its simplicity! A heating cable attached to the single hot water pipe keeps water at the desired temperature. 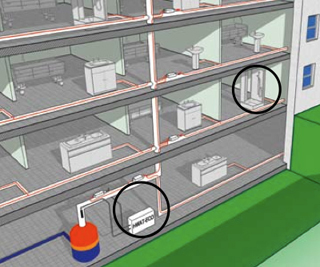 temperature can be selected, up to that of the storage tank temperature. proportion to how much it cools down. If hot water is flowing, the thermal output is reduced. maintenance system needs to be activated. network, not for heating the water. In this way, power consumption is reduced to a minimum. losses and keeps the temperature at the required level. whether recirculation or single pipe systems! is very easy, thanks to the building-specific software.